Ok, you most likely won’t get rich just from reading this article. The headline is designed to immediately draw attention. It is also a great way to draw in your target audience and eliminate those that aren’t interested. Listed below, I have put together some more time tested secrets to building an effective call to action, and if applied correctly, can at least get you on your way to becoming rich. One of the most common mistakes I see is people not creating a plan. The call to action is by far the most important thing to consider before writing content or designing your site. What do you want people to do? Don’t make them think about it… map it out for them and make it crystal clear. If you want them to click on a link, make it one of the first things they notice. If the goal is to have someone pick up the phone and call your business, make the phone number huge. The typical internet user is bombarded with advertising messages all day long, and they have built up a resistance to it. People no longer read the entire article, they look for short blurbs that offer a message and provide some substance. When writing your content and designing your web pages, try to keep this in mind and act accordingly. A good rule of thumb would be to write your content out, then try to remove ½ of the words. I don’t expect you to actually cut down ½ of your content. If you can actually do that, you really need to reconsider what your content strategy is. Hopefully, you are producing valuable content for your readers, but I want you to consider trimming it down if possible. Most people will only scan through your content, so your paragraphs need to be short and to the point. Most advertisers are all too familiar with the power of positive words, which is why so many advertisers utilize phrases such as “New and Improved” or “All Natural.” You need to keep that in your mind when writing your content. Depending on what your goal is, your call to action language should include words like Call, Buy, Donate, Register, Subscribe, Click, etc. Another super effective trick is to attempt to create a sense of urgency using phrases like Limited time only, Offer Expires in x minutes/hours/days, Order now and get free gift, while supplies last. I’m sure these all seem very familiar to you, persuasion techniques like this are used much more often than you may think. People will click all day if it isn’t a tough choice. The key to creating an effective call to action is not giving people too many choices to the point where they can’t decide. Never, I repeat never, have more than 2 different calls to action on the same page if it can be avoided. It is ok to have multiple calls to the same item, but if you give someone 5 choices, chances are good they won’t take any of them. Henry Ford once said, “Any customer can have a car painted any colour that he wants so long as it is black.” Henry Ford new a few things about guiding people to make easy decisions. In summary, creating a plan up front is a great first step to creating a clear call to action. Make sure you write your content and design your site with the user in mind. Readers are distracted easily, so hit them with a strong message, and keep it short if possible. Use action language and create a sense of urgency in your message, and don’t confuse them with too many choices. And remember, if nothing else, test and measure your results, and then repeat! Adam is a blogger, podcaster and entrepreneur who owns a web marketing firm called Roja Interactive. Adam has been working in the advertising industry for the past 10+ years, primarily in the digital space for advertising agencies. 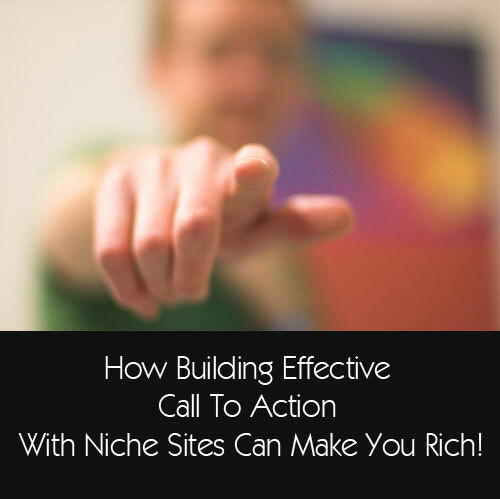 To contact or read more from Adam, visit his website about making money with niche sites. Thanks for letting me write this Larry. This site is awesome, and I am honored to have my content associated with yours, and available to your great readers. Adam – Thanks so much for writing it! I really appreciate your comments.